When we began watching the HBO TV series, A Game of Thrones, I was hooked and once we finished watching I immediately wanted to read the series, A Song of Fire and Ice. I’d just read The Sunne in Splendour by Sharon Penman, about the Wars of the Roses and had noticed the similarities between that and A Game of Thrones, the battles between the Houses of York and Lancaster paralleled by those between the Houses of Stark and Lancaster for example. 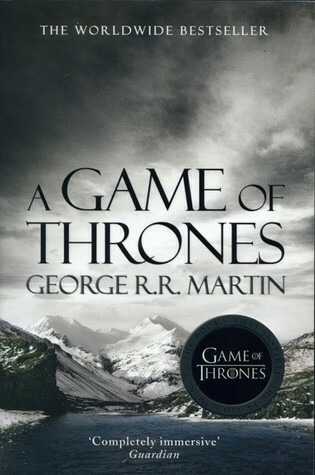 I don’t often read a book after seeing an adaptation, but in this case it proved ideal – the actors and scenery were perfect for my reading of the book, although there are some differences (the ages of the Stark children for example). I loved both the book and the TV series. As Warden of the north, Lord Eddard Stark counts it a curse when King Robert bestows on him the office of the Hand. His honour weighs him down at court where a true man does what he will, not what he must ‘¦ and a dead enemy is a thing of beauty. Lord Eddard “Ned” Stark, Warden of the North and Lord of Winterfell, Hand of the King. Bran Stark, second-youngest son of Eddard and Catelyn Stark. Jon Snow, illegitimate son of Eddard Stark, mother unknown. Daenerys Targaryen, Stormborn, the Princess of Dragonstone, sister of Prince Viserys, the last of the Targaryens. King Robert of the House Baratheon, Lord of the Seven Kingdoms, Eddard Stark’s oldest friend, married to Queen Cersei, his son Joffrey, spoiled and wilful with an unchecked temper, heir to the Iron Throne. Robb Stark, oldest true born son of Eddard Stark. He remained at Winterfell when Eddard became the Hand of the King. Tywin Lannister, Lord of Casterly Rock, Warden of the West, Shield of Lannisport. Khal Drogo – a powerful warlord of the Dothraki people on the continent of Essos, a very tall man with hair black as midnight braided and hung with bells. Winterfell: the ancestral castle of House Stark. The Wall: built of stone, ice and magic, on the northern border of the Seven Kingdoms, guarded by the Night’s Watch to protect the Kingdoms from the dangers behind the huge wall from ‘the Others’ and the Wildings. Beyond the Wall: the first book begins Beyond the Wall with members of the Night’s Watch on the track of a band of Wildling raiders. King’s Landing: a walled city, the capital of the continent of Westeros and of the Seven Kingdoms. Essos: across the Narrow Sea from Westeros, includes the grassland known as the Dothraki Sea. This article in The Telegraph lists the locations used in the TV series. “They were people of the Dawn Age, the very first before kings and kingdoms,” he said. “In those days there were no castles or holdfasts, no cities, not so much as a market town to be found between here and the sea of Dorne. There were no men at all. Only the children of the forest dwelt in the lands we now call the Seven Kingdoms. I shall be reading the next book in the series soon, A Clash of Kings. The other books are A Storm of Swords, A Feast for Crows, and A Dance with Dragons. Reading Challenges: Mount TBR Reading Challenge – a book I’ve had since October 2015, and the What’s In a Name Challenge – in the category of a book with a piece of furniture in the title. I’ve wondered about Game of Thrones many times. We don’t get it on Freeview (at least, I don’t think so) but I hear so much about it and I sort of realised I was might be missing something. Perhaps I’ll get a box-set at some stage and give it a try. I too, have managed to bypass this series on tv. But your review of the book has me excited, Margaret. I started thinking of Tolkien’s Middle Earth – not suggesting the two are identical but the detail, the backstories… Perhaps something to enjoy in the long winter weeks when they arrive. I always give Martin so much credit for creating a whole new world with its own realities. I think that takes a special kind of writing talent, and I’m glad you’ve enjoyed the first entry in the series. I look forward to knowing what you think of the others, Margaret. We’ve been watching it on DVDs but we’re just at series three now. I’ve been wondering if I should read the books or not – after this post I definitely will read them. Thanks.